Reviewed in the Israel Journal of Foreign Affairs by David Sultan, former Israeli Ambassador to Egypt. What was Gamal Abdel Nasser’s attitude toward Israel? Did it change as a result of his country’s stunning defeat in the Six-Day War? Was the Egyptian president willing to achieve a political settlement with Israel? Did Israel miss an opportunity to reach an agreement with Nasser? These are some of the questions with which historians and political commentators have been grappling for decades, while offering views that differ in terms of nuance, or more fundamentally, from the canonical version of events. Read the full review in the Israel Journal of Foreign Affairs. Check out what other readers are saying here! Special Book Discount for Christmas! 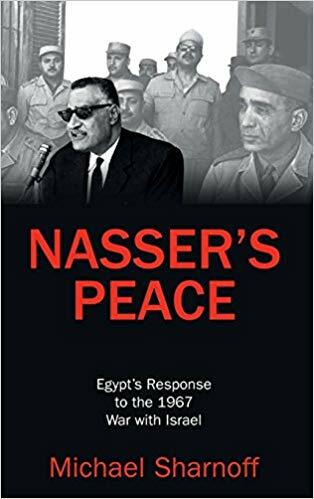 Order your copy of Nasser’s Peace in Hardback or eBook at a special discount for delivery before Christmas! See what early readers are saying here! What Can You Do with a CofC History Degree? Published in the College of Charleston Department of History. College of Charleston had a profound impact on my understanding and appreciation for history in general and Middle Eastern studies in particular. I am a South Carolina native and have always been fascinated in history and foreign affairs, ever since a family trip to the Middle East when I was a teenager. So it wasn’t a surprise when I decided to major in History. I arrived at College of Charleston enthusiastic about my studies, inspired by childhood trips to faraway lands. Published in Your Middle East. Nasser’s ultimate vision was to become the undisputed leader of the Arab world, and to exert his influence beyond Egypt’s borders. He implemented a brief union with Syria (1958-61) and renamed both nations as the United Arab Republic, but the project collapsed because Syrians viewed it more as an Egyptian occupation rather than a merger of equals. Wishing everyone a very happy and healthy New Year. For all those who have enjoyed this site, I would like to invite you to visit Sharnoff’s Global Views, a new global op-ed forum featuring original content by internationals for Americans. Please read well wishes for the New Year from His Holiness the Dalai Lama at www.sharnoffsglobalviews.com and share with friends, family and colleagues. Have them join our 80K+ growing worldwide community.